Theories: How did the Moon form? The Earth and Moon: Fun Facts! The Earth and the Moon have had a relationship that has endlessly piqued the interest of humanity. The Moon, the Earth’s only natural satellite, was formed roughly 4.6 billion years ago, which is close in time to the formation of the Earth. Throughout astronomical history, the questions of when, how, and why the Earth and Moon were formed, have been a debate between scientists, philosophers and various scholars. The following project will analyze the reciprocal relationship between the Earth and the Moon, discuss the theories supporting this relationship, as well as examine the uniqueness of Earth’s one and only Moon. Water has been on Earth since the beginning. Rocks found on Earth that came directly from Earth’s mantle contain small droplets of water composed of the same materials presently on Earth. Detrital zircon crystals formed 4.4 billion years ago have been found to have come in contact with water, meaning that the Earth had oceans at that time 2. This is not to say that water did not come from asteroids and comets; they very well may have added to the Earth’s oceans, but scientists think that water has been on Earth since the time that it formed. When Earth first formed, the surface was completely molten and there was virtually no atmosphere. When the Earth cooled, an atmosphere composed of hydrogen sulfide, methane and carbon dioxide formed3. Oxygen existed only in water compounds. As the life on Earth progressed, organisms produced oxygen to counteract the methane in the atmosphere. About 2 billion years ago was when oxygen started being produced on Earth4. The oxygen in the atmosphere continued to increase as life on Earth evolved. About 400 million years ago, oxygen made up 20% of the atmosphere. Life on Earth began about 3.8 billion years ago. At this time, only single-celled bacteria existed. Quite some time later, the life we are familiar with today began to form. Fish first evolved 530 million years ago, followed about land plants and forests in the next 150 million years. Mammals evolved 200 million years ago, and humans did not evolve until 200,000 years ago 5. 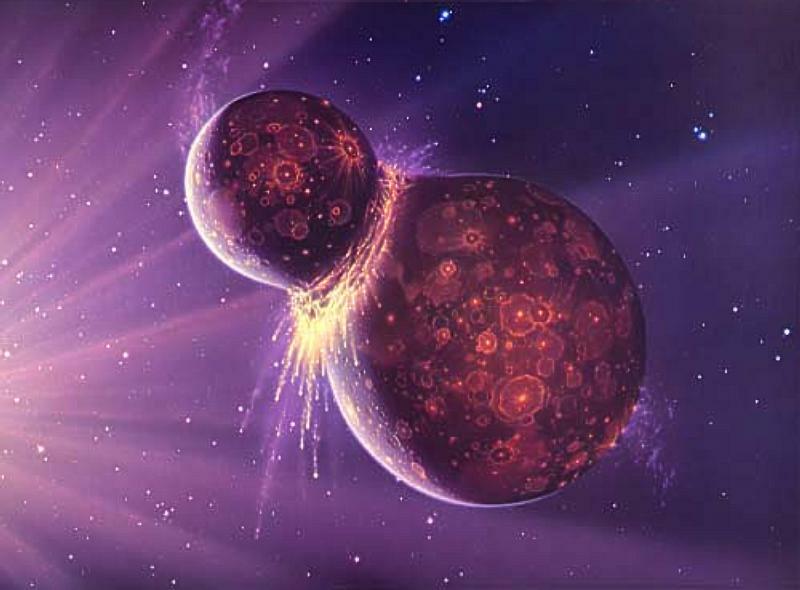 Figure 1: Asteroids collided with each other over many years in order to form larger bodies, like our planets. Science has concluded that Earth’s Moon began its formation process 4.5 billion years ago. Scientists have long believed that the Moon was formed because of a collision that happened between Earth and another planet 6. Early in history, Earth was struck by a Mars-sized planet and that planet was destroyed by its impact and most of the debris and some of Earth’s formed into a disk around the Earth and then eventually formed into the Moon. Earth’s gravity may have stretched the Moon, creating its odd shape. This event, which formed the Moon, put in motion the evolution of Earth. Since the Moon is present as a result of Earth’s existence, and it is believed to be from pieces of the then young planet’s crust, their relationship is important. The Moon has an important relationship to Earth for four main reasons. The first is that it provides a gravitational pull, which is the reason for tides. The gravitational pull from the Moon is strongest at the location on Earth that is closest to the Moon. In that location, the pull is so strong that it creates a bulge in the water, which then moves the water either towards the gravitational pull, or away from it 7. Tides are important to Earth because it allows regular changes to ocean depths, helps cycle warm and cold water, and they allow fish and their food to move alongside the tides, resulting in more sustainable resources. The second effect that the Moon has on Planet Earth is that it provides light to the night. Without the Moon, there would be nothing to reflect the sun’s rays off of, resulting in no light for a certain part of the Earth that is away from the Sun 8. The third thing that the Moon does for Earth is stabilizing our orbital tilt. Without the Moon it is possible that the Earth could tilt as much as 85 degrees, resulting in drastic temperature differences across Earth, as well as a change in our usual twenty-four hour day 9. The fourth thing that the Moon does for the Earth has an impact on both the animals and humans that live on it. Since the beginning of mankind, certain cultures and groups of people have held the belief that the Moon has an effect on animal and human reproduction, has an influence on menstrual cycles, fertility, hormonal changes, and birth rates 10. It also has influenced time on Earth such as the creation of the calendar that westerners are familiar with, the length of our days, also why certain parts of the day are called what they are. These four reasons are some of the main effects that the Moon has on the Earth. Figure 3: This photo is purely educational in the fact that it does not show the earth, or the water to scale. However, it displays just how the water bulges due to the gravitational pull of the moon, which results in both high and low tides. This theory proposed that the Moon was really a captured asteroid. This was thought to be true due to the moons of Mars; Phobos and Deimos, for they are captured asteroid moons; which was determined by the non-spherical shape that these moons had. Another hint of a captured moon is if its orbit is in a direction opposite of the planet it orbits 11</sup<. An example of this kind of moon would be that of Neptune’s moon; Triton 12. Because the Earth’s moon is rounded in shape and orbits with the Earth, it disproves the theory that Earth’s moon is part of the capture theory. Also, if you were to imagine the speed of the Moon or asteroid as it whizzed by, it would be improbable to assume that the Earth captured it: the extremely slow approach speed required would imply a far greater likelihood of a collision or ejection 13. Another reason why the Capture Theory is not a plausible hypothesis for the formation of the moon is because with the age of the Earth being 3.8 billion years old, and the Moon being 4.5 billion years old, it would seem odd for the Moon to be parked for 1 billion years before the Earth was formed and then pull it out when we need it.14. Giant-Impact Theory was established over a decade ago, and has received more support than many earlier models. Planet formation is thought to start with sticking and frictional coagulation of dust particles in a gaseous nebula that persisted in the circumstellar disk 21. These particles begin to grow in size until there is a gravitational attraction between large-sized bodies. Major collisions between small proto-planets eventually result in objects the size of the Earth 22. It was theorized that the Moon coalesced from a ring of debris produced by such a late-stage collision between two Earth-forming proto-planets 23. The impact could have splashed enough debris into the Earth orbit to form the Moon. It could also have knocked the Earth into its 23 degree tilt, ensuring the precession of the seasons. A giant impact would have also melted Earth through and through. Some geochemists contended that a giant impact and its inevitable melting of Earth does not jibe with what they know of geochemistry 24. There is hope that the geochemists will likely find some way around this apparent inconsistency. The Fission Theory was first proposed by George Darwin in 1879. He proposed that the Moon originated from a rapidly spinning Earth on which equatorial gravitative attraction was nearly overcome with centrifugal force 15. The resonant effects of solar tides adding to the centrifugal force to overcome gravity and separate the solar tidal bulge into our present Moon. Once separated, it was driven out to its present position by transfer of rotational energy and momentum through the gravitative effects of the Earth’s tidal bulges 16. The argument is simple. If you were to put all the mass and angular momentum of the Earth-Moon system back into one single body, the body would rotate in four or five hours 17. In order for it to break-up, it needs to spin much faster. Therefore, in terms of the Fission theory, the angular momentum would have had to be more than three times its present value 18. Don Wise, a professor at the University of Massachusetts and John O’Keefe propose that the only way to get rid of the angular momentum was to suppose that after the fission, the whole system – especially the Moon- lost a lot of mass, because of its lower gravity. Therefore, it would be expected that the immediate result of fission would be two wildly oscillating bodies. These oscillations could be represented by Fourier analysis of the sum of a lot of waves of different periods and different phases 19. Because of different periodicities, it would be a long time before they would be sufficiently close to the proper phase at the proper time, or corotation 20. These oscillations, in the real world, would eventually die out ruling the Fission Theory an unaccepted theory in geochemistry and astronomical formations. The Moon continues to be characteristic of the night sky on Earth appealing to stargazers and astronomers across the world. The origin and purpose of the Moon lingers in the minds of the majority of the stargazers, perhaps provoking a higher interest level and desire to further explore Earth’s natural satellite. Many of the planets in our solar system have naturally orbiting satellites; however, what is unique about Earth’s is that there is only one moon. So how do we know that this is characteristic of only Earth? An examination of the advantages and disadvantages of having only one moon around Earth compared to the satellites of the other planets in our Solar System can support our knowledge of the Moon’s purpose and effect on Earth. A key area of research as to why the terrestrial planets such as Earth have fewer moon’s than the Jovian planets is the incident formation of our solar system. A study into the factors of gravity, chemical incidence, and temperature have been proven as important factors in the number of natural satellites surrounding each of the planets, and currently contributes as to why Earth has one moon 25. This theory explains the importance of the state of chemicals surrounding the planets in the formation of planetary satellites, especially in the furthermost planets. It is believed that during the formation of the solar system, much of the material around the Sun was in the gaseous state due to the high temperature, while the further areas included more solid particles such as ice 26. These particles formed together to produce larger celestial objects, contributing to the large number of moons orbiting distant planets 27. One significant advantage to having only one moon is that the effects of it on Earth can be more readily observed and analyzed as any gravitational effect that is present is due to specifically the one moon, and not a combination of effects from others. The definition of a moon as a natural planetary satellite can cause confusion at times when analyzing the effects of our known moon, as pseudo-satellites, such as asteroids pulled into temporary orbit of the Earth, can also alter the effects experienced by Earth 28. Another advantage is that the Earth only varies its tilt by about one degree because of the gravitational pull of the Moon; without it, it would vary by nearly 10 degrees 29. It is also speculated that the tidal effect from the Moon is what stirred the ocean to induce modern biodiversity, especially in the era of single-celled microorganisms 30. This is believed to be a factor due to the Moon’s mass, which is 1/81 that of Earth, while an average moon is usually approximately 3/10000 of its planetary mass 31. The gravitational pull from the Sun on Earth involves a correspondence with the mass of the Earth, but the moon actually contributes to the mass of the system, rather than specifically the mass of only Earth. A second moon would change the gravitational energy on Earth, altering tides and potentially creating violent volcanic activity 32. The Earth’s tilt would change by approximately one degree, which accounts for a change in vegetation cycles during the seasons (Figure 1). A new moon could potentially change the lighting of Earth, resulting in either longer days or longer nights depending on the size of the Moon, which would have an effect on the ecosystems on the planet 33. The effect of gravity is only about 17% as strong on the surface of the moon as it is on Earth, meaning that objects (including humans) are actually lighter on the Moon. 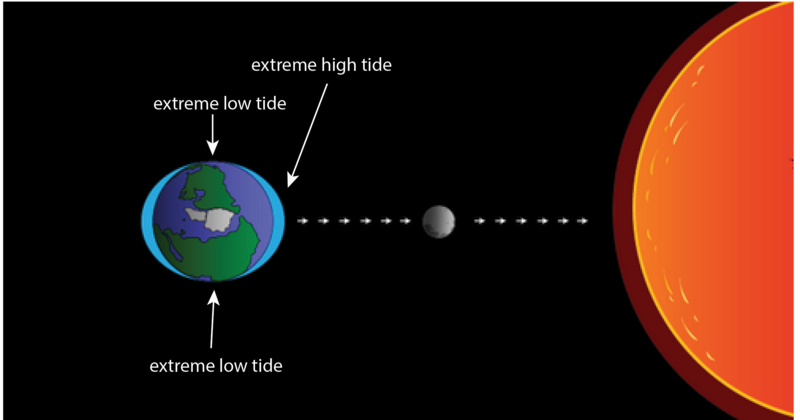 The Earth’s ocean tides are largely caused by the Moon’s gravitational pull and the Moon itself, most scientists agree, features small amounts of water, while the surface of the earth is 70% water 35. The Moon, like the earth, is thought by scientists to have a molten core. The Earth is the densest planet in the Solar System. This density varies according to the part of the planet; for example, the metallic core is denser than the crust. The average density of the Earth is approximately 5.52 grams per cubic centimetre where the moon is 3.34 grams per cubic centimetre. This means that the Earth and Moon’s compositions are very different, and the Earth is much larger 36. Unlike Earth, the moon has no atmosphere, meaning it is unprotected from cosmic rays, meteorites and solar winds, therefore causing huge temperature variations. The lack of atmosphere also means no sound can be heard on the Moon and the sky will always appear black 37. The Earth’s rotation is gradually slowing. This deceleration is happening incredibly slowly, at approximately 17 milliseconds per hundred years, although the rate at which it occurs is not always the same. This has the effect of lengthening our days, but it happens so slowly that it could be as much as 140 million years before the length of a day will have increased to 25 hours 38. The Earth is not actually round in shape; its shape is known as a geoid. A geoid is defined as a model of global mean sea level, used to measure precise surface elevations. The Moon’s shape is also an imperfect sphere, as strong gravitational forces pull it in different directions. Scientists believe it “froze” in its current shape billions of years ago when it orbited much closer to the Earth 39 (Figure 9). Figure 9: Example of a Gravity Anomaly Map. 1 Encrenaz, T. (2004). The solar system (3rd ed.). Berlin: Springer. p. 89. 2 Graham, C.M. et al. (2001). “Evidence from detrital zircons for the existence of continental crust and oceans on the Earth 4.4 Gyr ago” Nature. 409 (6817): 175–178. 3 Stanley, Steven M. (2005). Earth system history (2nd ed.). New York: Freeman. 4 Gale, Joseph (2009). Astrobiology of Earth : the emergence, evolution, and future of life on a planet in turmoil. Oxford: Oxford University Press. 5 Leakey, Richard (1994). The Origin of Humankind. Science Masters Series. New York: Basic Books. 14 O’Keefe, John, A. The Origin of the Moon: Theories involving Joint Formation with the Earth. Astrophysics and Space Science; 1972. Vol 16. Article. 15 Wise, D. An Origin of the Moon by Rotational Fission during Formation of the Earth’s Core. Journal of Geophysical Research; 1963. Vol. 68:5. Article. 16 Wise, D. An Origin of the Moon by Rotational Fission during Formation of the Earth’s Core. Journal of Geophysical Research; 1963. Vol. 68:5. Article. 17 O’Keefe, John, A. After Apollo: Fission Origin of the Moon. Science and Public Affairs; 1973. Bulletin of Atomic Scientists. Article. 18 O’Keefe, John, A. After Apollo: Fission Origin of the Moon. Science and Public Affairs; 1973. Bulletin of Atomic Scientists. Article. 19 O’Keefe, John, A. After Apollo: Fission Origin of the Moon. Science and Public Affairs; 1973. Bulletin of Atomic Scientists. Article. 20 O’Keefe, John, A. After Apollo: Fission Origin of the Moon. Science and Public Affairs; 1973. Bulletin of Atomic Scientists. Article. 21 Halliday, Alex, N., Drake, Michael, J. Colliding Theories. Science; 1999. Vol. 283: 5409. Article. 22 Halliday, Alex, N., Drake, Michael, J. Colliding Theories. Science; 1999. Vol. 283: 5409. Article. 23 Halliday, Alex, N., Drake, Michael, J. Colliding Theories. Science; 1999. Vol. 283: 5409. Article. 34 Collins, Carolyn. Jones, Chris. (2012). Earth Facts and Moon Facts. Retrieved from http://space-facts.com/earth/. 35 Collins, Carolyn. Jones, Chris. (2012). Earth Facts and Moon Facts. Retrieved from http://space-facts.com/earth/. 36 Choi, Charles Q. (November 19, 2014). Moon Facts: Fun Information About the Earth’s Moon. Retrieved from https://www.space.com/55-earths-moon-formation-composition-and-orbit.html. 37 NASA. Moon: About the Moon. Retrieved from https://moon.nasa.gov/about.cfm. 38 NASA. Moon: About the Moon. Retrieved from https://moon.nasa.gov/about.cfm. 39 Pappas, Stephanie. Roy Britt, Robert. (March 23, 2016). 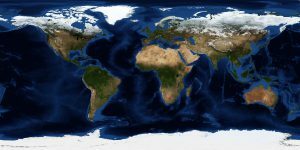 50 Interesting Facts About Earth. Retrieved from https://www.livescience.com/19102-amazing-facts-earth.html.